Based on the image above and examination while viewing Jurassic Park, it appears there is no physical connection between truck and track (though there may be). Is the proposed method of moving the tour vehicles - having them follow a track that moves them along with electricity - actually a viable method of moving a vehicle? I just understood the difference between the JP SUVs and electric trains (and OP's original question) -- that the SUVs don't appear to contact the track, where as subways and other electric trains have physical contact with a "third rail" or wire. This is what I was getting at - I am familiar with monorails and how they work. What I was hoping to learn was whether or not a a track could propel a car without (discernible) contact electrically - which @wbogacz addresses. I think the question is whether an autonomous car technology exists. The answer is yes. People have been talking about autonomous cars and driverless highways since the 40's (corrected from 70's), and I met people during my job in the 90's who were hired to design such systems. Also, the technology is independent of the power needed to propel the car. Gasoline/electric power - the technology makes no distinction. I think the movie made the car electric because it could be easily disabled for the plot. UPDATE: While reviewing the relevant movie section, I hear Samuel Jackson specifically mentions the car batteries, leading me to think the track supplies no energy. 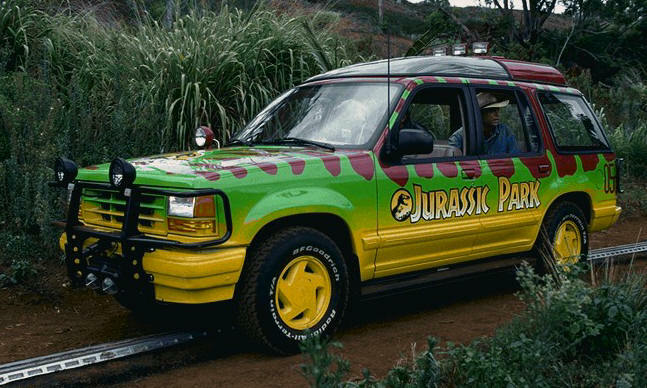 When the kids and the scientists jump out of the car to aid the Triceratops, the central computer says something to the effect 'Stopping park vehicles...'. When Nedry (Newmann) sets the power to fail so he can escape, the track data flow fails to the vehicles bringing them to a halt right next to the T-Rex cage. T-Rex is no longer contained by 10k volts. I've worked on the implementation of automatic guided forklifts which travel around facilities by following low-frequency signals sent through wires in the floor. The wire needed to be within about an inch of the surface of the floor for reliable guidance; in an outdoor scenario with unpaved roads, an unprotected wire close enough to the surface to offer reliable guidance would almost certainly snag on something and get pulled up in short order. Having a protective "track" to hold and protect the wire would probably make such a thing workable, however. As for the effect of killing power, even though the forklifts could not receive power from the wires in the floor, an unexpected loss of signal would cause the vehicle to immediately stop (it was possible for the navigational program to indicate that the vehicle should be willing to travel a certain distance without seeing a signal, to handle some places in the floor where it would be necessary to switch from following one wire to following another, but if the vehicle didn't find a signal were it was expected, it would stop moving.